Studying fossil teeth and bones under the microscope is a really rewarding venture. After spending the time and energy making a thin section, you get to be the first person to see the microscopic details of your sample, sometimes with amazing clarity. The process of fossilization doesn’t erase all of the tissue-level details of your sample, but instead preserves them well enough (usually) to compare them with modern tissue samples! 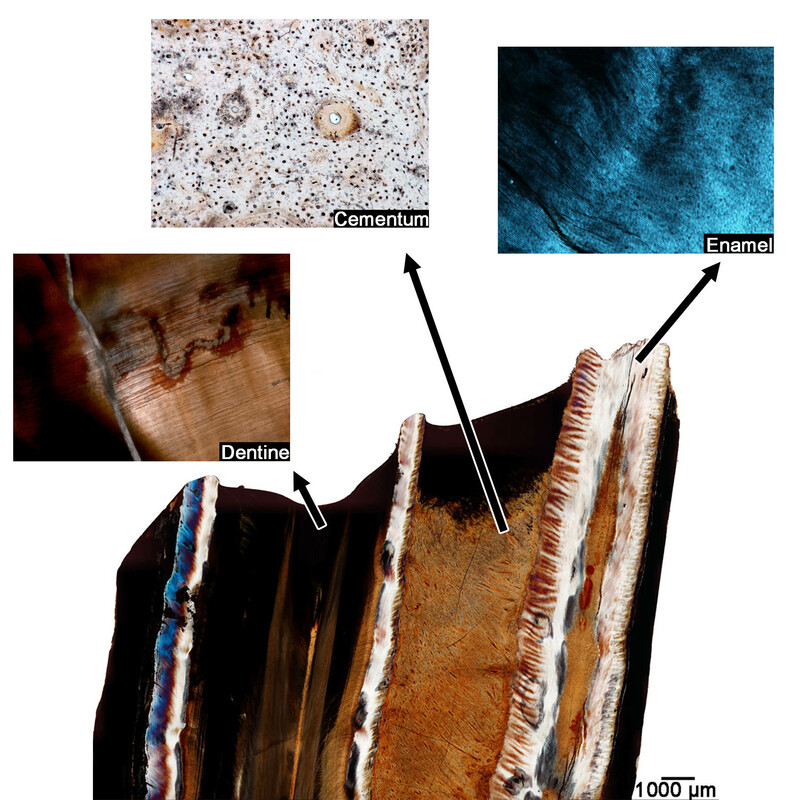 This page presents a series of thin sections that I have made over the years that show the kinds of details you can see when looking at fossil teeth and bones in thin section. Horse tooth in coronal section. 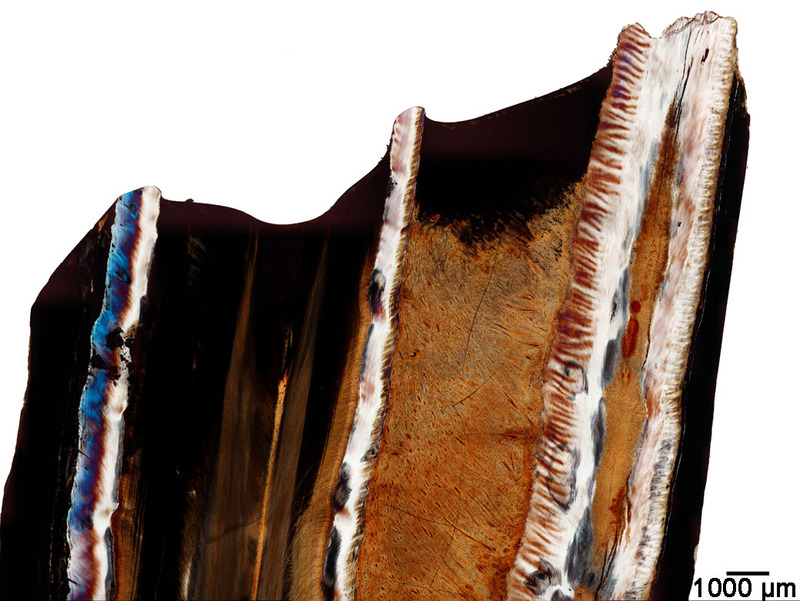 This is a histological section through a fossilized horse tooth. You’re looking at the chewing (occlusal) surface at the top and the root and the jawbone would be towards the bottom, which are out of the frame. Horses have evolved really complicated chewing surfaces that are made of three distinct tissue types (see below). Our teeth are also made of these tissues, but in horses, they’ve been rearranged to make these complicated chewing surfaces. In most mammals, the chewing surface of the tooth is capped by enamel, the hard white part of our teeth that we brush everyday. We don’t usually see the other parts of the tooth, but there are two other hard tissues that make up the rest of a tooth: dentine and cementum. In horses, the enamel and the other tissues overlap each other in such a way that as the tooth is ground down, the three hard tissues are exposed at the same time. The three tissues that make up the chewing surface of a horse tooth. The enamel in the horse tooth is white under normal light when viewed under the microscope. This is because enamel is almost entirely made of mineral crystals and is clear when it’s thinned down far enough. Using a special type of lighting called cross-polarized light (a filter on our microscope allows us to change the lighting), you can see the orientations of the tiny threads of these crystals as they weave back and forth to strengthen the enamel. The other two tissues, cementum and dentine, are more orange-ish and brown under normal light. Dentine normally makes up the bulk of our teeth and is perforated by tiny tubes that run roughly parallel to each other. In life, each of these tubes was filled with an arm-like extension from a single cell that lived at the centre of the tooth. These tubes are also partly filled with nerve cells that provide some of the sensitivity that we feel when our teeth contact something hot or cold. The final tissue is cementum. Cementum is normally restricted to the roots of our teeth, but in horses it reaches all the way to the top of the tooth. 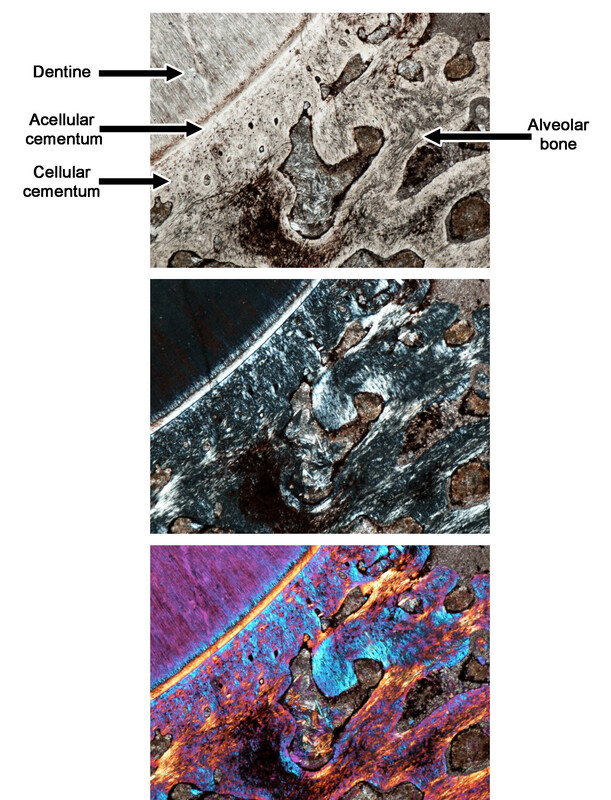 At higher magnifications, you can see that the cementum contains tiny black dots that once housed individual cells that were responsible for maintaining the tissue. The large circular channels in the cementum surrounded blood vessels that would have nourished these cells. Enamel, dentine, and cementum wear down at different rates as the horse chomps down on tough vegetation. Enamel, the hardest tissue in the vertebrate body, wears down the slowest, whereas the other two tissues wear down considerably faster. This ensures that horse teeth constantly maintain ridges of enamel and valleys of cementum and dentine on their chewing surfaces, providing an excellent surface on which to grind tough plant tissues for digestion. Horse teeth are a marvel in dental evolution! Closeup of a tooth root and surrounding attachment tissues of Dimetrodon. 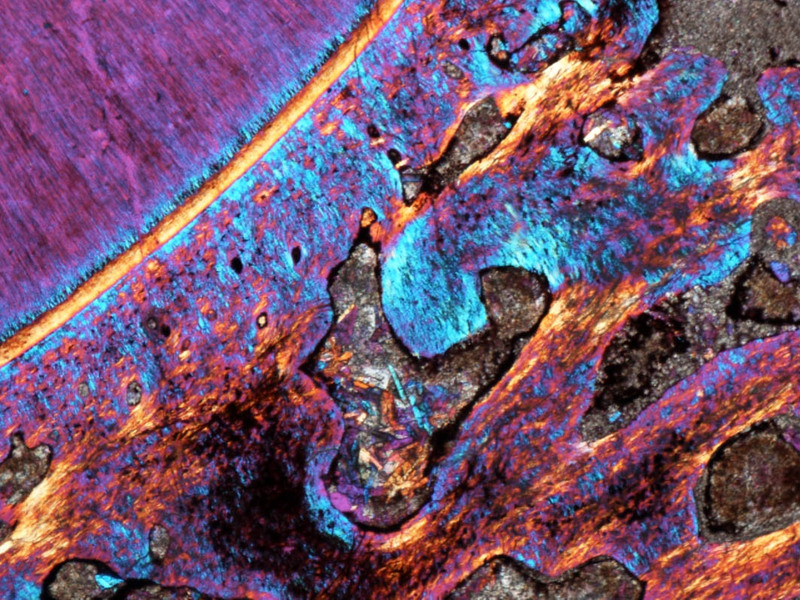 This is a closeup of a thin section through the tooth root and the surrounding hard tissues that fuse the tooth to the jaw in an extinct animal called Dimetrodon. The beautiful colours are the result of a special lighting filter (we call it a lambda filter) on our microscopes. The teeth of Dimetrodon are fused to the jaws by a type of spongy bone called alveolar bone. Our teeth are surrounded by alveolar bone too, but it doesn’t make contact with the roots of our teeth like this. Instead, our teeth are suspended in their tooth sockets (which are lined with alveolar bone) by a soft ligament. This isn’t the case for most non-mammalian vertebrates, though. The teeth of most non-mammal groups are fused to the surrounding bone, just like this one. Some of the boundaries between tissue types in Dimetrodon may not seem too clear under normal lighting. For this and other reasons, palaeohistologists often use different lighting filters to visualize different aspects of the bone and tooth tissues they’re looking at. The most common technique is to use cross-polarized light. This is just a filter on the microscope that disrupts the pathway of light in such a way that you can visualize the orientations of the crystal structure of bone and other hard tissues. The crystalline structure of hard tissues is typically invisible under normal lighting. The middle image shows what a thin section looks like under cross-polarized light. Note that the tissue labeled “acellular cementum” is now a bright band that is easy to see, whereas the dentine is now almost black. The surrounding tissues look like a mess. Some parts are bright, some parts are dark. This is because the remaining tissues (“cellular cementum” and “alveolar bone”) have a very disorganized crystal structure, so some parts light up, whereas others stay dark. The final image – the one with all the colours – results from applying an additional filter that shows the same information as under cross-polarized light, but instead of showing it as dark and light patches, it highlights the crystalline structures as different colours. These different filters are important for understanding the composition of hard tissues like bone and dentine and are therefore used quite often. They also make for pretty pictures. This is a cross-section through the base of the front upper tooth of a peculiar, extinct little reptile called Colobomycter. A drawing of the skull of Colobomycter (courtesy of M. MacDougall) highlighting the giant fang at the front of the jaws. The SEM image of the premaxillary bone with a giant tooth (right) shows where the thin-section was taken. Colobomycter is a very unusual little reptile (actually, it’s a parareptile, an extinct reptilian group that was very diverse during the Permian period, between 300 and 250 million years ago). If you were holding the skull of this animal in the palm of your hand, the first thing you would notice is its enormous front teeth. The bases of these front teeth are lightly folded along the outside, but on the inside, the folding is incredibly complicated. The base of the tooth is almost entirely made of dentine, the tubular hard tissue that makes up the bulk of any tooth. The difference is the shape that it makes. If this were a cross-section through the front tooth of a human, it would be doughnut shaped. The dentine makes a cylindrical tooth root that would be circular if you cut it in half. In Colobomycter, the cell layers that define the shape of the tooth fold into a complicated shape before dentine begins to form. Dentine then grows around these folds and gradually fills in the interior of the tooth root. The result is this peculiar looking cross-section with what some call “petalloid dentine”, because it sort of looks like a bunch of flower petals. If you look closely at one of these folds, you’ll notice that some of the folds aren’t straight, but bend and weave to form a more complicated structure. A closeup of the plicidentine in Colobomycter. The tiny dark lines are the tubules that are typically found in dentine. The dentine grows towards the middle of a tooth in all vertebrates and so it fills in the spaces around the main folds over time making it LOOK like the dentine folds, when in fact, the folding happens before any dentine is laid down. No one’s really sure what these folds do, but in a paper that colleagues and I published in 2014, we argued that these folds may have helped to increase the surface area for attachment of these massive front fangs, because the folds become extremely complicated at the base of the tooth.